Last week, the two of us had gotten together at Serena’s house to continue our long and drawn out re-watch of a show that both of us enjoyed in childhood. That show is “Lois and Clark: The New Adventures of Superman,” and it was a formative part in both our childhoods when it came to portrayals of Superman in popular culture. With the new trends of the DC Universe leaning more towards gritty and ‘real’ interpretations of their characters, it’s been very fun going back and watching a more light-hearted version of Clark Kent/Superman, and his best gal-pal Lois Lane. Even though there are a lot of things about this show that are painfully 1990s (see below for one of many fashion statements), the storylines, characters, and themes really hold up for 21st century sensibilities. So we thought that it would be fun if we took a fond look back on this show and the ways that it brought Lois Lane, Clark Kent, and all the important characters of Metropolis to life! “Lois and Clark: The New Adventures of Superman” premiered on Sunday nights on ABC in September of 1993. Teri Hatcher was cast to play Lois Lane with Dean Cain as Clark Kent/Superman. Before “Lois and Clark,” Hatcher was probably best known for recurring roles on “The Love Boat” and “MacGyver,” though one of her first jobs was as a cheerleader for the 49ers. These days people will probably know her best from the show “Desperate Housewives,” but to us she will always be known as the best damn Lois Lane there’s been. For the part of Clark Kent, the NFL was consulted once again, as they cast Dean Cain, a former player for the Buffalo Bills who remained benched for the entirety of his career due to an injury. He did commercials and guest roles before winning the role of Clark Kent. The series creator, Deborah Joy Levine, was the show-runner for the first season. Unfortunately, the show’s time slot left it in direct competition with “Murder, She Wrote,” so top performance was not in the cards straight out of the gate. (Angela Lansbury was, and still is, a formidable foe.) But a solid second was the goal, and Levine and her writers knew they had to approach their characters in a way that would be family friendly, but entertaining for adults as well. In a departure from most previous Superman storylines and depictions, “Lois and Clark” refocused its story on the relationship between Lois Lane and Clark Kent rather than the exploits of Superman, with Supes’ dazzling feats of heroics often playing an exciting, but decidedly second, fiddle. Between season 1 and 2 a number of changes were made. The show completely dropped the character of Cat Grant, the saucy and bawdy gossip columnist at the Daily Planet (played perfectly by cult TV show staple Tracy Scoggins), and replaced their Original Jimmy Olson, Michael Landes, with Justin Whalin to make Jimmy 2.0. FUN FACT: In the commentary of the pilot episode on the DVD release, it was revealed that this recasting was due to a concern that Landes, also dark haired and eyed, too closely resembled Cain’s Clark Kent. Season 3 was the most successful of the seasons ratings-wise, though much of the show became about a wedding between Lois and Clark that just couldn’t quite get off the ground. But by Season 4 ratings started to drop, the show got tossed around different time slots, and even though the titular characters did finally get married “Lois and Clark” was eventually not renewed for a fifth season (though apparently they had been told that they probably would be). FUN FACT: The wedding episode was timed to air with the release of the comic book “Superman: The Wedding Album” which featured the same marriage for the first time in 60 years; the first “for realsies” marriage that is, as there were several dream sequence type “fake outs” over the many decades previous. The show ended with Lois and Clark, after being told that they wouldn’t be able to have any biological children together, finding an abandoned baby on their doorstep wrapped in a blanket featuring the Superman symbol. So ultimately, what was meant to be a cliffhanger, oddly helped wrap the show up in a suitably ‘happily ever after’ kind of way. The final episode aired on June 14th, 1997. The show took a couple of interesting characterization stances when it came to telling the stories of Lois Lane and Clark Kent/Superman. The first was that it was made clear early on that Clark Kent does not have the usual life balance that Superman had in other comic and movie portrayals. In the show Clark lives in an apartment, acts like Clark when no one is looking, and doesn’t become Superman as we know him until the pilot episode. He is even unaware of his Kryptonian background until several episodes into the first season. In this way, it is firmly established that Clark Kent IS his identity; Superman is his alter ego. FUN FACT: To further emphasize this shift in dominant personalities, Clark Kent and Superman’s hair styles are swapped with Superman sporting the slicked back and stylized hair, while Clark Kent features the more natural and laid back floppy style. Clark’s humanity is further highlighted with the many romantic blunders that he commits throughout the show’s running. We spend much of our re-watches throwing our hands up in frustration and saying “No, Clark! Not again! Lois…you can do better.” “No, she can’t, it’s Clark.” “You’re right, and I’m sorry for saying it, but really…?” Cain plays the role with a sincere but goofy take, always pulling back at the right moment to prevent the character from taking himself too seriously. Cain’s strengths definitely lie in his portrayal of Clark Kent. Due to the show’s focus on Clark as the character and Superman as the role, when Superman is on screen he is often saddled with the cheesier aspects of the show, a fact that isn’t helped by what are now very dated special effects. The character is further weakened by his isolation from the rest of the cast, often working against the aforementioned over-the-top villains for the most part with only dashes of interactions with a Lois who (especially in the first two seasons when she doesn’t know his true identity) is often at her most lovesick and ridiculous. While Cain is still effective in this role, the added layer of playing the character of Clark who is then playing the character of Superman adds a certain strain to his acting that can seem a bit forced at times. In the end, it is Hatcher who carries the show with the stronger performance. While Lois plays the usual ‘damsel in distress’ role, she is also written as a very competent and well respected reporter. From the beginning through to the show’s end, Lois is clearly the superior reporter and takes the lead in their professional life. And, let’s be real, their personal life too, once she gets the whole super identity thing figured out. Hatcher wraps up a character who could verge into the realm of overbearing and ridiculous within layers of sweetness, insecurity, and vulnerability that makes Lois completely relatable and endearing. And ultimately, it is the undeniable chemistry between Cain and Hatcher that carries the show. The progression of their relationship, from strained co-workers, to friends, to dating, to married life, is always peppered with the perfect amount of humor, respect, friendship, and finally love, and is joy to watch. Other regular characters included Jimmy Olson, Perry White, and, in another notable difference from many Superman stories, the routine appearance of Jonathan (thankfully living!) and Martha Kent. The villains on “Lois and Clark: The New Adventures of Superman” ranged from fairly realistic corporate and crime moguls, to strange and out there time travelers, ghosts, or in the case of Spencer Spencer, a head on a deformed torso that he hides in a box. The show’s most recognizable villain, however, is Lex Luthor, played by John Shea. This interpretation of Luthor follows the John Byrne version of the character, who isn’t so much a mad scientist as he is a corporate villain with lots of money at his disposal. This version is the one that many people think of for Luthor these days, and Shea fits the part to a t. Shea’s Luthor is charismatic and charming, a villain that is pretty fun to hate. Or not hate, in Kate’s case. Shea has good chemistry with Cain in their antagonistic moments, but his chemistry with Hatcher crackles. The viewer can hate him for not only wanting to take down Superman, but also because he effortlessly and, one could argue, realistically romances Lois away from Clark. While it would have been an obvious choice to make him a bad boyfriend, Hatcher’s strong, confident Lane would never have tolerated that. So this Luthor is formidable in all ways, and the ultimate villain for the show. And then the character was killed off at the end of Season 1. This gave other villains time to shine. While a few of the comic book villains did show up (perhaps most notably Mr. Mxyzptlk, played by Howie Mandell), quite a large number were original. FUN FACT: Aside from Lex Luthor, General Zod is likely one of the best known Superman villains. However, the show could not get rights to the character. Instead, they created a nearly identical character named Lord Nor who, alongside a group of Kryptonians, attempts to take over Earth in season 4. Many times these villains would be B-lister guest stars, or people who made their name in other sci-fi/fantasy television shows or movies. 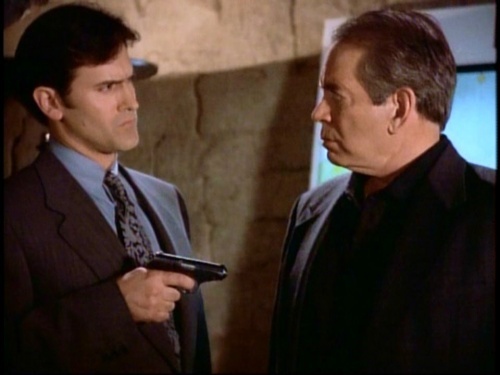 You had Bruce Campbell playing Bill Church Jr., the leader of the nefarious organization Intergang. You had “Star Trek: Next Gen” alums Denise Crosby and Jonathan Frakes playing Lex Luthor’s ex-wife and a wealthy megalomaniac, respectively. 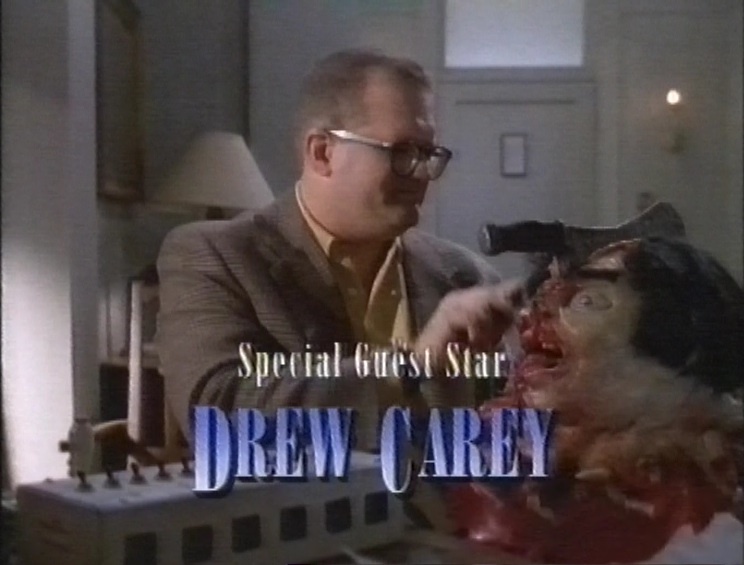 Even people who had shows on ABC at the time would make tongue in cheek guest appearances, as was the case with Drew Carey from “The Drew Carey Show” when he played a realtor who accidentally summoned the ghost of a murder victim. Kathy Kinney, who played Drew’s nemesis Mimi on “The Drew Carey Show,” was the ghost, naturally. The villain-of-the-week became the name of the game format of the show, and the more scenery they could chew, the better. Luthor did return a handful of times for a couple of small arcs (reanimation for the win!) But even he wasn’t unaffected by the new “the bigger the better” bottom line for how villains were portrayed. He went from a suave and chill super-villain with a bank account to a crazed science experiment gone mad with dreams of revenge and reconnecting with his lost love, Lois Lane. Shea played both versions well, but it’s safe to say that he was more fun when he was tangling with Superman with an ice cold demeanor, unphased by most things that the Man of Steel could throw at him. The upside to this carousel approach to villains is that the show really is, at its heart, about Lois Lane and Clark Kent figuring out their relationship, and Clark figuring out how to function both as himself and as Superman. So ultimately, it’s just as well that the villains, Luthor aside, never stuck around too long. The prolonged angst of dark and demented nemeses wouldn’t fit the tone of the show at all. The villains serve their purpose, but at the end of the episodes they are, usually, vanquished, and the status quo is returned for Lois and Clark. Look how thrilled she is to be working with him. You probably won’t be surprised to hear that my favorite episodes come from the first season, as that was the season that was more grounded in subtleties. I love “Pilot,” as I feel that it perfectly establishes every single one of the characters as the show is writing them. Clark Kent comes to the Daily Planet looking for a job and looking for a normal life, but by the end of the episode he’s taken on the Superman role in hopes of helping others. Lois has the perfect introduction in this, just coming off an undercover case that she has totally nailed. She is ambitious and snide, but clearly has a very good heart along with a good head on her shoulders. Her disdain for boy-scout Clark Kent as her new partner (a partner she does not want nor think she needs) is hilarious. Plus Dean Cain just embodies the persona of Clark Kent with his ‘aw shucks’ demeanor. And an MVP award has to go to Lane Smith, who is the best damn Perry White ever with his blustery attitude and ‘God I hate/love my staff so much’ demeanor. He takes a chance on Clark, but doesn’t let him off easy either. That’s the Perry I know and love. I also have to give a shout out to the episode “Fly Hard,” the nineteenth episode of Season 1. In this one Clark, Perry, Lois, Jimmy, and Lex Luthor are being held hostage at the Planet by a group that is trying to find a large amount of money hidden in the building. This one I really like because it has a good amount of suspense, a very funny scene involving Cat being completely oblivious about her co-workers being held hostage, and one of the best pick up lines that Lex Luthor has given in the history of Lex Luthor pick up lines (“[Money] can’t buy brown eyes.” I’m sorry, I’m kind of a Lois/Lex shipper on this show because of how good Shea is when he’s on screen with Teri Hatcher). “Fly Hard” sticks out in my mind very prominently. I definitely agree with Kate’s picks and would have listed them as well! For my picks, I’m going to highlight an episode from Season 2 and Season 3. For Season 2, one of my favorite episodes has always been number 7 “That Old Gang of Mine.” It also perfectly illustrates the more nonsensical villains that were introduced in this season by featuring a mad scientist who, after discovering that he knows how to raise people from the dead, decides that the best way to impress people with this power is to bring back famous criminals such as John Dillinger and Al Capone. What is this plan?!? Anyways, Lois and Clark investigate, but while undercover, Clark gets shot. Of course, Clark, not being Superman, must “die.” This episode was a real turning point for Lois’s character with the realization of how deeply she depends on Clark’s friendship. Clark, too, also realizes how important his life in Metropolis is (Clark’s history before the timeline of the show involved him globe-trotting and never laying down roots due to his lack of a secret identity and inability to not help when he sees something going wrong). Their reunion is also very cute! 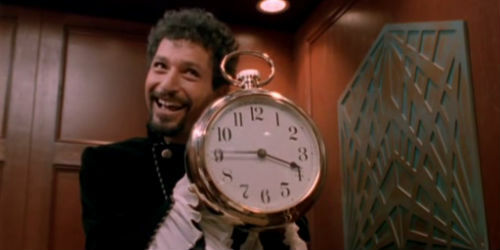 The second episode that I always love rewatching is in season 3 episode 13 “Tempus, Anyone?” Aside from Lex Luthor, Tempus is the second most-used villain in the show, appearing in 3 out of the 4 seasons. A time traveler from the future, Tempus for some reason doesn’t like good things and wants to prevent the utopian future that was created due to the actions of Lois/Clark/Superman, so whenever he shows up, time tomfoolery is sure to happen! His appearance in season 3 is his second attempt at disruption when he whisks Lois away to a parallel universe where things are very different. In that universe, Lois died years before meeting Clark. More so than almost any other episode, this is a “Lois episode,” not only featuring her as the well and true heroine of the story, but also highlighting how crucial her presence is to those around her, most importantly, to Clark. So, there you go! A very long winded “brief” history of our love for the 90s classic “Lois and Clark: The New Adventures of Superman.” Are there any older tv shows that you consider lost gems? Let us know in the comments below!